for organizing this hop and inviting me to participate. 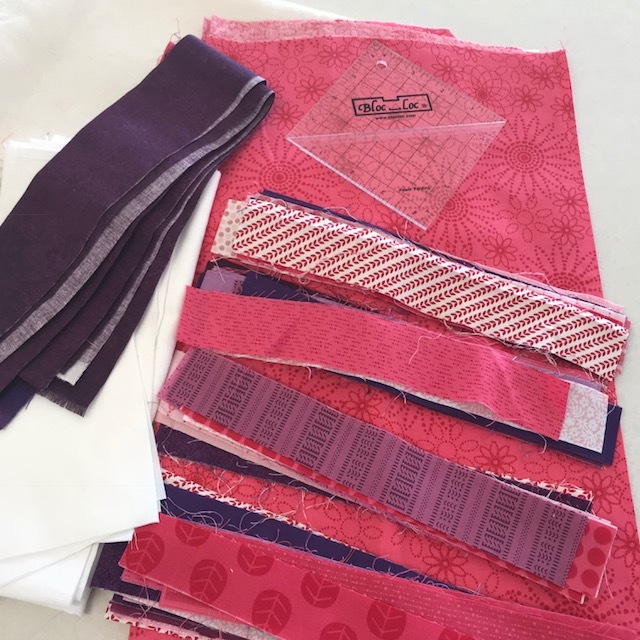 sew I pulled these pinks and purples for my project. You can get full details of how to make this over there. The tutorial uses 1 1/2" strips and I had plenty of those. I liked the light to dark layout. I made some strip sets, and cut 12 squares from them. 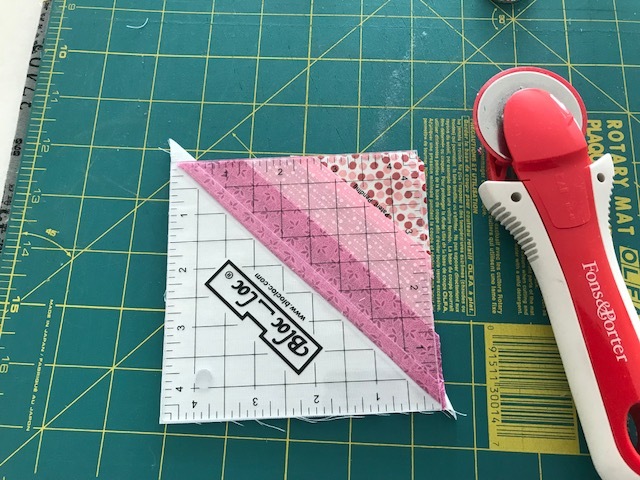 I luv the BlocLock ruler for trimming up the HST squares. 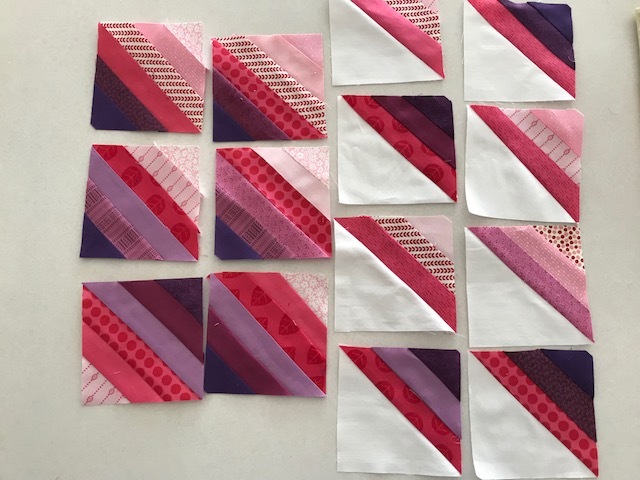 OK now I have 6 strips set squares and 8 HST squares. and Echo Quilting around the heart! The quilting shows up great on the back, too! The pink backing fabric was just right for the binding. for hanging it as a wall quilt. a yardstick (cut to size) for hanging. Love my customized labels from Border City Quilts on Etsy. by and give them some love! here are the participants for previous days. call on Valentines day to say "I love you?" Make sure you are a "no reply blogger"
I can contact you if you win! 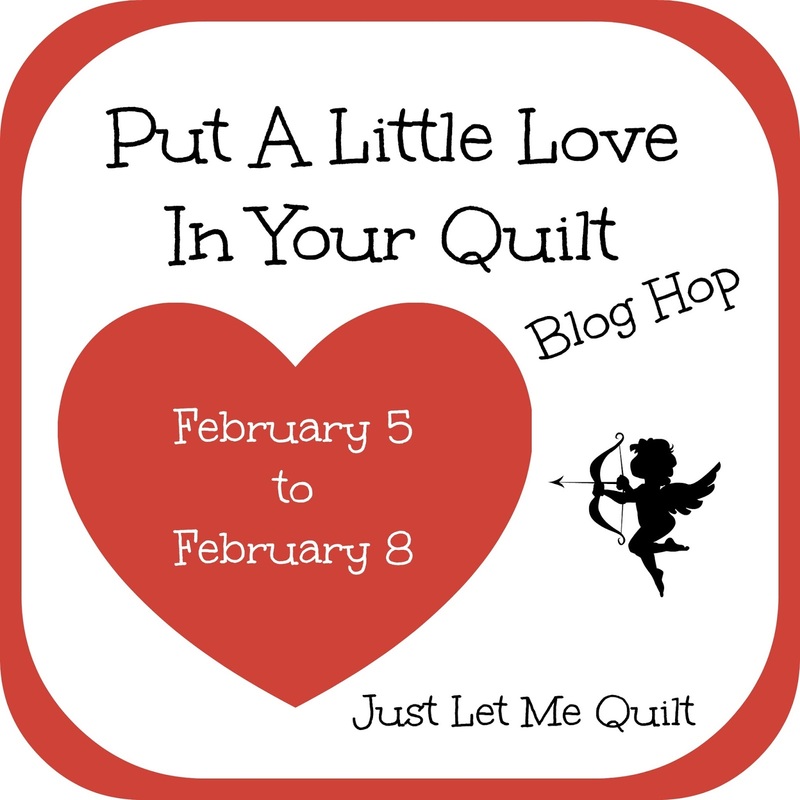 "Put a Little Love" in your next quilt! What a sweet quilt, hearts are always fun on a quilt. Cute quilt!! 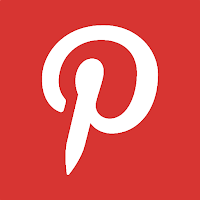 I would love to see how to make a wall hanger from a yard stick too! On Valentines Day as my children all have moved out of state for work I will call my two sons and my daughter! Thank you! Great quilt. And quilting. Thanks for the chance to win. You won the zipper pouch. I sent you an email! Congrats! I would call my grandson as Valentine’s Day is also his birthday. 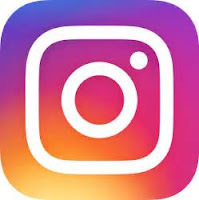 I enjoyed following along with your design and didn’t figure out until the end, that those strip blocks would turn into a heart. A lovely surprise. Your open wide bag looks great. I have wanted to try and make one of those but wondered how hard it would be. Very nice...it is soooo cute! I love it! Thanks for sharing! I will be calling my daughter on Valentines Day. I wished I had seen this Blog Hop before I made a Valentines Wall Hanging for my mom's door in the nursing home. You Bloggers are so creative and made such nice things. I will call my grandchildren and let them know that I love them. This is really a different take on the heart design, very nice. and thanks for sharing the pocket idea. Like that much better than the sleeve on the mini's. Oh that makes my heart happy too! love the pocket triangles and do that on some of my small quilts for wall hangings. That little bag is so cute as well, would love to win - the fabric you used is really cute I haven't seen that before. I forgot to mention I will call my Kids. What was the finished size of this mini please. The wall hanging is so cute Kathy. 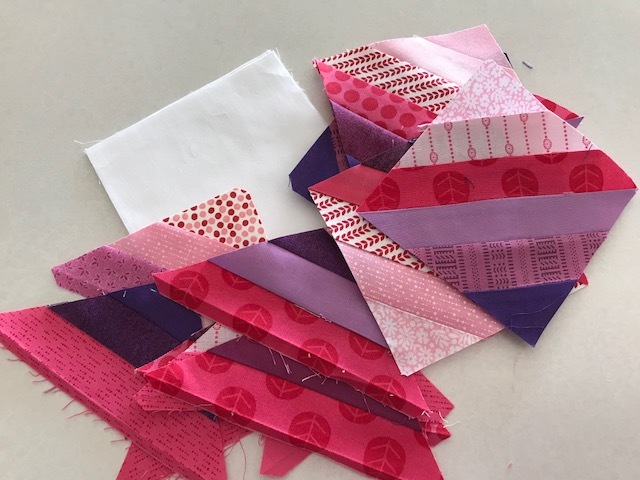 And I love the idea of using scraps to make it. Beautiful job! I am thinking this would make an awesome quilt.Thank you for sharing. I will be calling my grandson on Valentines Day.Thank you for the giveaway. You made a beautiful mini quilt! Thanks for sharing! I will call my sons. I just love this little heart quilt , very clever . I will call my Mom on Valentine's day , I know she would appreciate a little love. Love the heart wall hanging--so pretty! Straight line quilting is pretty. I use it sometimes too. I will probably call some of my grandchildren on Valentines Day. Thanks for sharing! That is beautiful and your fabric choices are gorgeous. There will be so many to tell them that I love them - Mom, husband, children and grandchildren. This is lovely - thanks for sharing. 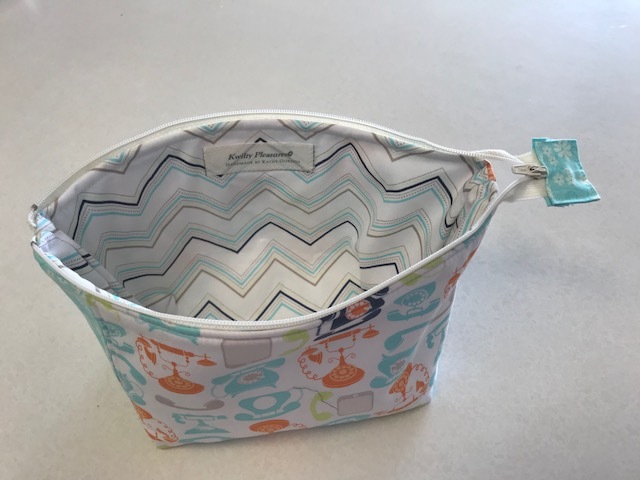 WoW, I am not sure I could attempt half square triangles like that, but the project is so adorable, I might attempt it. 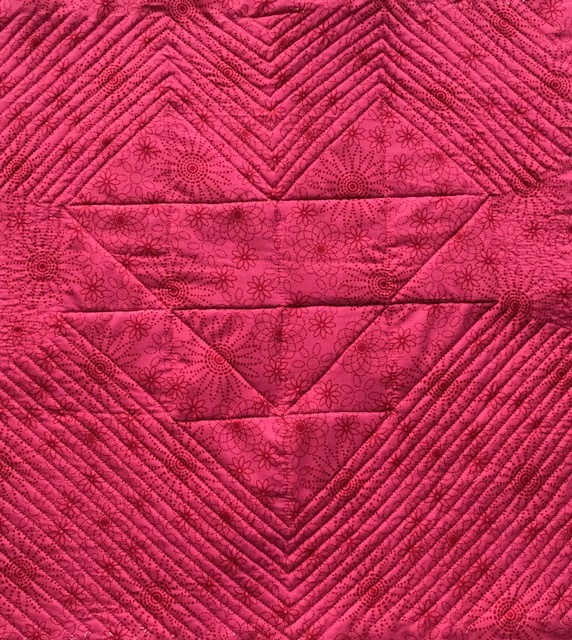 Love the echo quilting it really makes that heart just pop Kathy. I'll call the pizza man, I love you that I don't have to cook tonight AND I get my pizza without leaving home! What a beauty and perfect to use up strips. 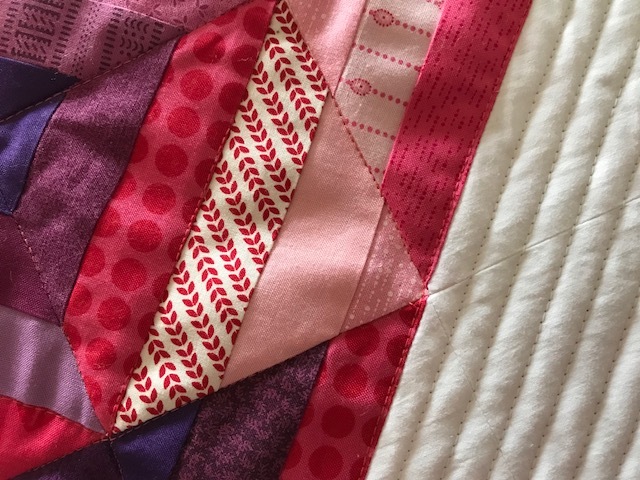 I think straight line echo quilting is perfect and anything but simple for me. You make it look easy. I'll be calling my hubby on Valentine's day because I must be out of town. I love a good scrap buster and this is "sew" perfect. Thanks for the reminder that it's always a good time to express our love! 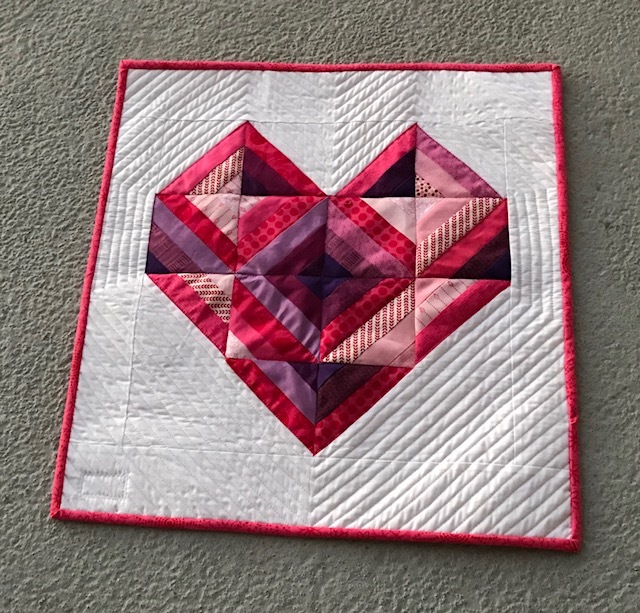 Love your heart quilt! I will definitely call my sister. Does it really say 1 1/5" strips? I doubt my rulers have that measurement. I love your heart squares! 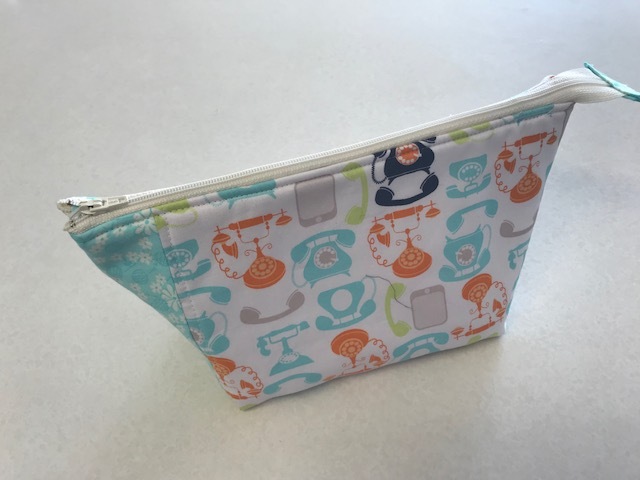 Cute zipper pouch! How cool is that! You are so creative! Thanks for sharing your String Heart and offering up that awesome zippered pouch!! I'm going to call my son on Valentine's Day to remind him how much I love him. I am so into scrap play right now. Your heart turned out great! Thanks for showing the corner hangers - I'm putting a binding on a gift mini in the morning, and I'll do those instead of a hanging sleeve. Much better for her, I'm sure! 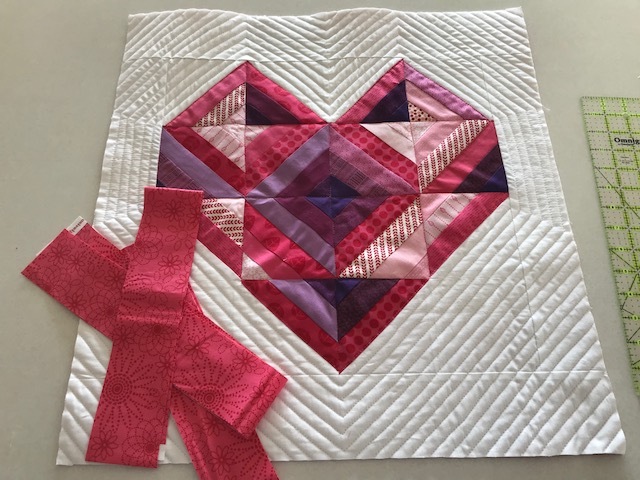 I adore your heart quilt!! 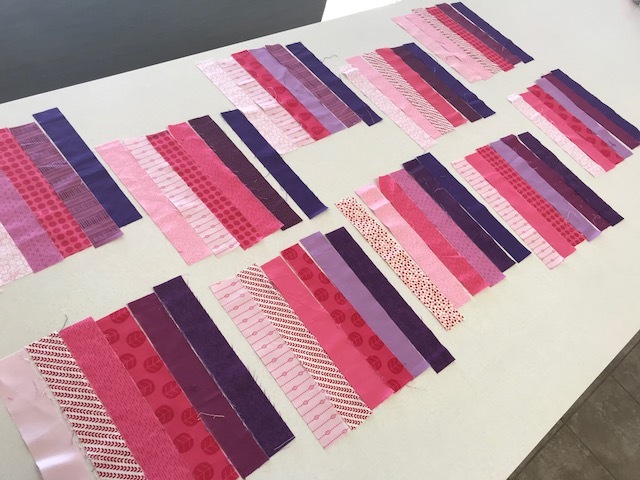 As I watched the beginning of your post, I just assumed you were doing a typical string quilt. What a happy surprise that you went with something so fresh and fun! 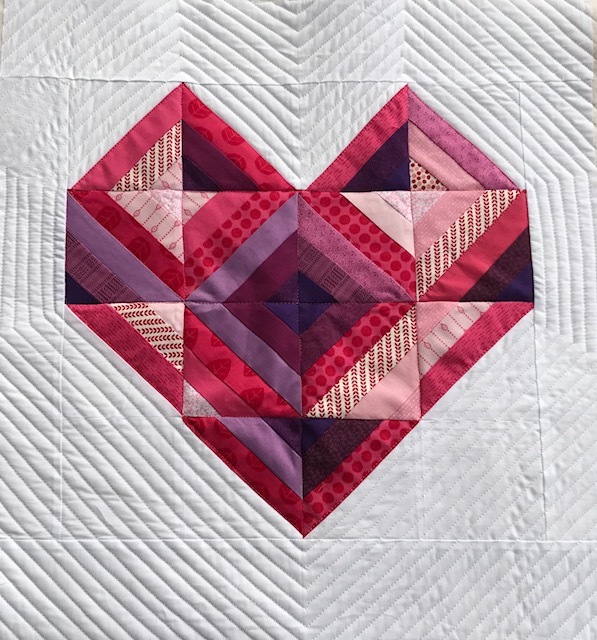 I do love anything with strings, but this heart quilt is adorable and so well constructed. Thanks so much for sharing it and being part of these great blog hops! Love your heart! Thanks for sharing. How cute. I wasn't exactly sure what heart design you were creating; what a sweet surprise when you had it finished. Hubby is definitely on my "I Love U" list though I make sure to send the grands cards and tell them 'we' love them. Happy Heart Day. 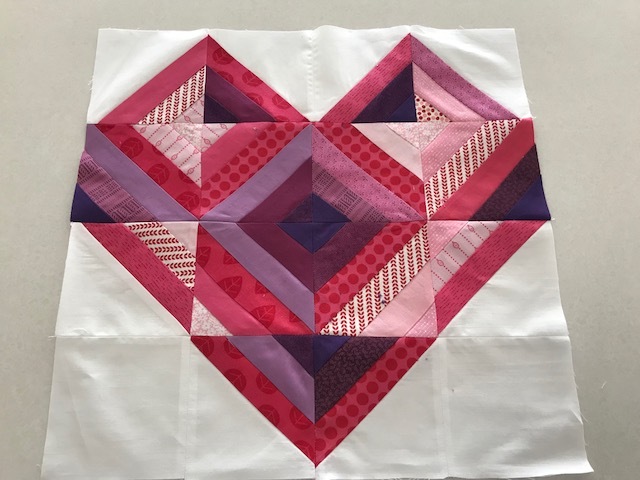 The strip heart quilt is a great scrap-eater! Like your label! I'll be calling my daughter to say Happy Valentine's Day! Very pretty quilt. I will call my mom to say Happy Valentine's Day. Pretty quilt. I agree it is happy. I will call my daughters, and grandkids. Cute. I'll only be calling my son on Valentine's day. Thanks. I am down in New Zealand, so not an entry, but I need to say, what a wonderful heart, a super design, and those colours sing with happiness. Kathy, what a beautiful quilt! Fun to see all the steps to create the heart and quilt it. You can definitely feel the love. So LOVEly! I have never tried the bloc-loc rulers, but that looks pretty slick. On Valentine's Day, I'll call my daughter who live in Hawaii. Thanks! Sweet heart, thanks for aiming us at the instrucitons. 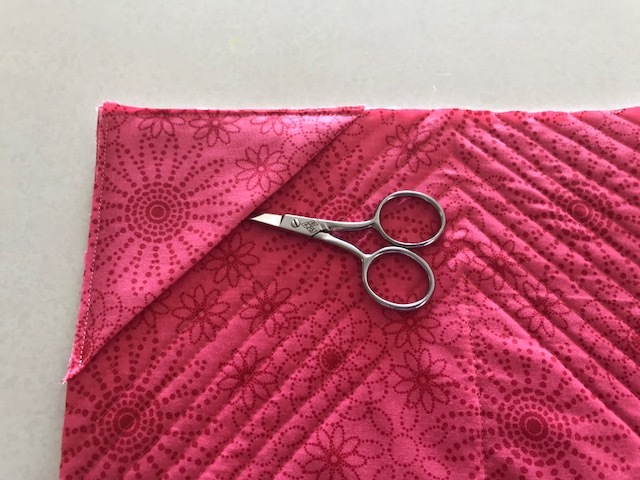 Your quilting is wonderful, great job and thanks for sharing your work with us. I am going to call my grandkids on Valentine's Day. They are so precious to me. Cute pattern. Thanks for sharing it. I wish I could call my Dear Hubby's Aunt. She had her birthday on February 14th. I have a friend here in town that celebrates her Valentines Birthday but doesn't eat Chocolate. The pouch would be a fun gift. I will call my son! There are several others but he’s at the tip! I love your quilt and thanks for the tip on the sleeve for hanging. I love the pouch, it’s so cute! Thanks again for a chance! Very clearly shared. Very nice heart quilt. There is no one to call really as everyone lives here. We are going to make Martha Stewarts Upside Down Lemon Merinque pie.